School’s out for the winter break, but as kids from St. Joseph Elementary School were getting ready to wrap up the first half of their year, the cheers ringing out as the last bell pealed were probably coupled with the sound of a few chattering teeth. But it was all for a good cause as the school turned down their heat by two degrees for Toonies for Warmth. In the student-led initiative, the students this year braved the cold and put their toonies forward for the right to wear their favourite sweaters to school – ugly Christmas sweaters or otherwise – to raise money for St. Vincent de Paul. These young students are old hands at putting packages together for people in need. Operation Christmas Child, which tasks students putting together shoeboxes of gifts for needy kids abroad, is a particularly popular initiative within the St. Joseph Community. Normally the school takes on the challenge every other year. 2015 was slated to be an off-year, but the students would hear none of that. But they have heard plenty about the Syrian Refugee Crisis. 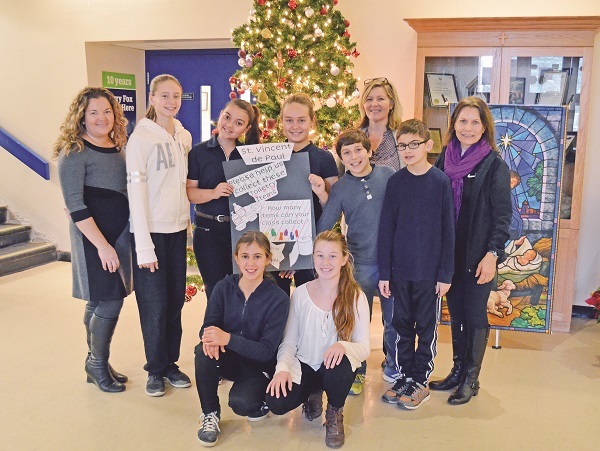 With this humanitarian issue receiving such widespread attention, it captured the imagination of students at St. Joseph. They began to feel a personal connection with those affected, says the teacher, and spurred them into action to learn more and do what they could to help, hosting a fundraising sock hop and snack bar for Hallowe’en to benefit Project Hope.